Dipping a toe into the sea of space: Are we Columbus or Erikson? by Lifeboat Foundation Scientific Advisory Board member Gregory Benford. Text of a speech given at the Advanced Space Propulsion Conference, Aosta, Italy, June 2005. 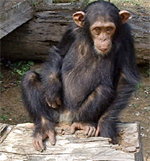 There are three forms of chimpanzees: the common chimp, the bonobo, and us. We are the only chimp who got out of Africa. That experience reflects and probably laid down the deep human urge  indeed, our signature: the urge to restlessly move on, explore, exploit. Natural selection gives us a gut imperative that plays out physically and culturally, our goal: the expansion of human horizons. 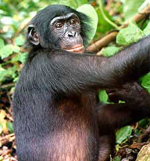 Three forms of chimpanzees: the common chimp, the bonobo, and man. Human history has favored both the spatial and cultural expansion. Fresh prospects yield new perspectives. Life springing from the sea to land was similarly favored. We now stand on a beach, our world, timidly dipping a toe into the sea of space. We stare into this ocean of night and imagine we are the Columbus generation. I fear we may be the Leif Eriksons. Leif Erikson reached North America five centuries before Columbus. Curiosity drives us at this early stage. This is proper and intrinsic. The grandest question we can solve in our generation is to find whether life began and survives on Mars. With a mass the tenth of ours, it cooled off first and did not suffer the impact by a Mars-sized object that Earth did, forming our uniquely large moon. We know it had early wet days and much liquid erosion. Did life arise and migrate beneath the soil, perhaps persisting still? Meteor impacts transferred matter from Mars to Earth far more often than the reverse. Microbial life could survive the trip and seed our early seas. We may be Martians. Even more exciting, Mars may harbor a different type of life, not even DNA based. If so, life is probably common in our galaxy, because it arose twice in a single solar system, a powerful argument. I know no biologist who thinks we can settle this point without smart exploration  by humans. Robots are just not up to it. A manned expedition to Mars would be one of the great defining events of this century, as Apollo’s moon landing was in the last. It would be thrilling, dangerous, and witnessed by all humanity, with daily fresh vistas. We would come to know the small crew better than our neighbors. Unlike Apollo, their scientific curiosity would be crucial to their character. This strong link between exploration and science suggests the next phase of our ventures into space  finding resources and living there. 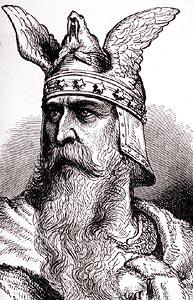 Leif Erikson did not live off the land, but the later Europeans did. This was critical to their persistence. We do not now live in space; we camp there. The space station never addresses the two crucial elements needed to explore the planets  a closed, renewable biosphere, and centrifugally made gravity. Without those, we will go nowhere beyond our moon. NASA plans to return to the moon in twice the seven years it took us before. Mars comes a decade later, so no astronaut now working can hope to go. This is a plan for failure. By 2015 the US Federal budget comes under severe strain from the retirement and medical plans in place. Agencies which spend money in jobs programs producing “luxuries” like a space program will suffer. Meanwhile, new global problems will loom. Very probably, climate change driven by fossil fuel emissions will worsen. Currently, carbon dioxide levels rise along a curve predicted by economists decades ago. China, India and other ambitious countries pay no heed to nations that, in their view, never gave up easy energy sources when it hurt them economically. This pattern will persist. To solve global problems, think globally. 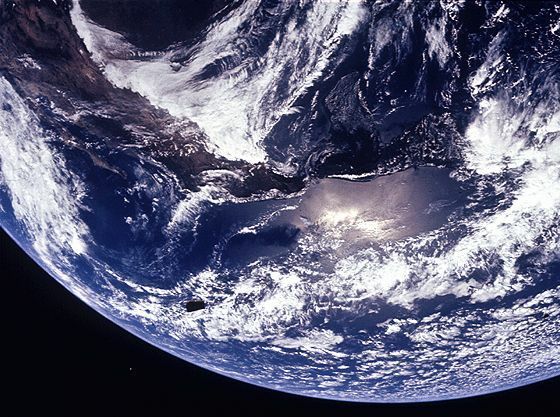 The easiest and cheapest way to cool our world is by reflecting more sunlight back into space. Clouds do this best. Producing them over the tropical oceans, which absorb most of the sun’s bounty, is cheap, using technologies developed many years ago. We can do more, too, in our own lives. Our own habitation covers about 1% of North America and 3% of Europe. We can reflect sunlight from them at little cost. Lightening roof colors, mixing sand and glass into asphalt, and similar measures can also lower the cooling costs in summer, saving fossil fuels and paying for themselves. A US Department of Energy study showed this a decade ago, but was ignored. We need a global perspective. To monitor all this takes a global perspective, seen from space. So will gathering resources from beyond our moon. In the second half of this century, metals will become harder to find in the Earth’s crust, and more costly and damaging to extract. There are plenty of metals in the asteroid belt. Inevitably, we will need them. Bringing them to Earth, smelting them in high orbits  all this could help fuel an expansion of the global economy. We certainly need such expansion, while minimizing the impact of our growing numbers. Indeed, the greatest agenda of this century will be the expansion of human horizons by uplifting the bulk of humanity to a standard of living enjoyed by the advanced nations. That would complete the promise begun 500 years ago by the first European expansion, following on Leif Erikson without knowing his role in their own history. We will need those informed minds. We forget that most of humanity still labors in routine manual labor, walking behind a plow or assembling in a factory. What Einsteins or Beethovens are doing that now, dreaming of a better life? Only by expanding their conceptual horizons through a modicum of prosperity can we liberate our species from drudgery. Frontiers breed liberty. They make possible freedom of movement and ideas. A fundamental revolution in human destiny began half a millennium ago with the European breakout onto the oceans of Earth. That opened new cultural vistas after centuries of little progress and few freedoms. Room to breathe and think anew is not sufficient to ensure progress, but it is essential. Meanwhile, my friends jump off bridges on giant bungee cords and run hundreds of miles in desert heat  for fun. Around us in the extreme entertainment culture there are ample signs of a society with far too much spare time on its hands, and no sense of new horizons. Space is, as the cliché goes, the final frontier  because it is infinite. But it takes courage, bravery and imagination. We cannot have a future that we do not first imagine. That is why we must explore and then open to our use the beckoning lands beyond our sky. They are the horizons our species needs and was born to win. Dr. Gregory Benford is the professor of Plasma Physics and Astrophysics at UCIrvine (University of California, Irvine). 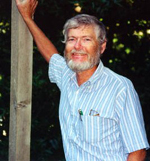 Gregory earned his Ph.D. in Physics from the University of California, San Diego in 1967. He is a member of Phi Beta Kappa, a Woodrow Wilson Fellow, and a consultant for NASA. He is also a popular science fiction author.